This book considers the impact of multinational companies in China on the Chinese economy and on indigenous firms in China. It shows how the global business environment has undergone profound changes since the early 1990s, leading to an explosion of merger and acquisitions activity and consequent unprecedented degrees of concentration in many industries at a global level. 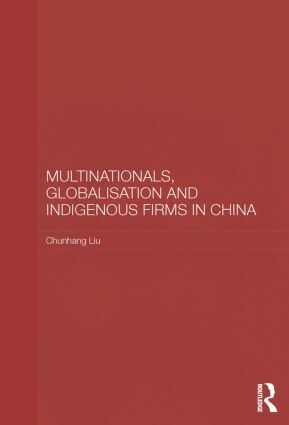 It discusses the effects of these developments on the Chinese economy – both on multinationals and indigenous firms – analysing company strategies, activities and value chain structures. It shows that, as China’s integration into the global economy increases, new, globalised value chain structures are becoming the established norm across the Chinese economy. In particular, it explores the effects of these developments for local Chinese firms, where the strategy of "catch-up" has recently been a primary goal, demonstrating how difficult it is for Chinese firms to achieve "catch-up" when the competitors they are chasing are themselves moving forward and evolving so fast. The book includes detailed case studies of Boeing, Wal-Mart and Coco-Cola, considering their activities both at the global level and within China, and case studies of the sectors in which these forms operate in China. The book’s profoundly important conclusions concerning the impact of multinationals on the local economy and on indigenous firms are applicable to other developing economies as well as to China.